For decades in the 80s and 90s, Forest Hills Stadium was underused, neglected and in a state of vast disrepair. In its prime, the concert and sports venue, which opened in 1923, hosted legendary bands and artists like the Beatles, Jimi Hendrix, the Rolling Stones and Frank Sinatra. It produced many memorable summers for music and tennis lovers alike. It was the original home of the U.S. Open, before the tournament moved over to the National Tennis Center in Flushing Meadows-Corona Park. It was in Forest Hills where Arthur Ashe and Althea Gibson broke tennis’ color barrier. Despite such history in one venue, when tennis moved out, concerts went along with it, as more and more local neighbors complained about the out-of-control noise. Soon, the stadium became a shell of its former self. In comes Mike Luba, a prodigious concert promoter who hails from Long Island and now lives in Chelsea. Luba, with his boutique agency Madison House Presents, engaged the community and stadium owner West Side Tennis Club to form a plan to revive the legendary stadium. Thanks to a multi-million dollar renovation that included a new stage, handrails, benches and, perhaps most importantly, sound-suppression measures, Forest Hills Stadium hosted the British rock band Mumford and Sons in 2013. The rest, as they say, is history. Luba helped transform the defunct venue, which was nearly sold to make way for condos, into a thriving place for concertgoers. The stadium has recently hosted legends like The Who, Van Morrison, Dolly Parton, Bob Dylan and Paul Simon, and welcomed the return of professional tennis. 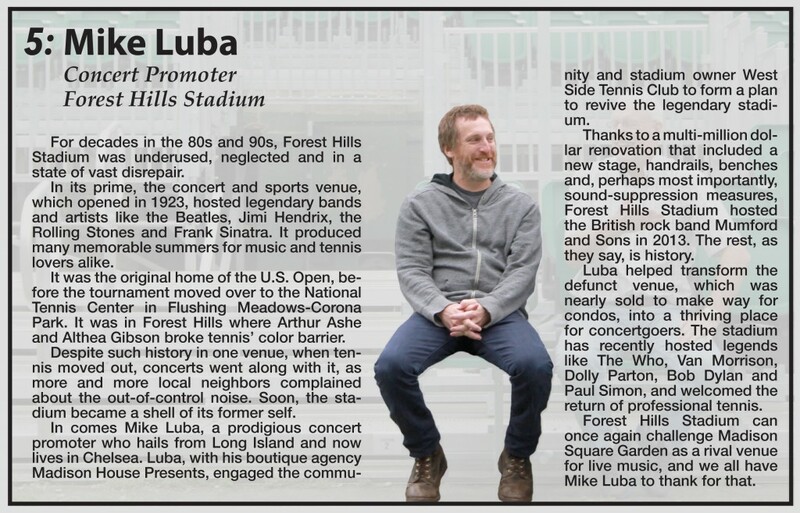 Forest Hills Stadium can once again challenge Madison Square Garden as a rival venue for live music, and we all have Mike Luba to thank for that.